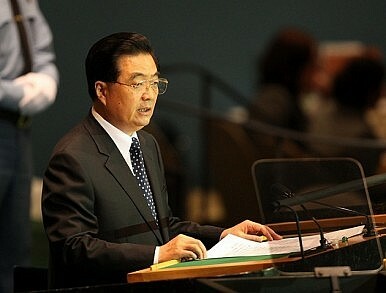 Hu Jintao warned that China was in a cultural war with the West. But the real problems are at home. Last week, fellow China Power blogger David Cohen discussed Chinese President Hu Jintao’s essay remarking that China and the West are locked in a cultural war. The language and rhetoric used in the essay – “We must clearly see that international hostile forces are intensifying the strategic plot of Westernizing and dividing China, and ideological and cultural fields are the focal areas of their long-term infiltration” – alarmed Western observers, and brought to mind images of Red Book-waving Red Guards. Throughout his tenure, Hu has presented himself as the most disciplined and faceless of technocrats, so this is one of those rare moments when he’s actually said something worth commenting on. I’d like to offer some thoughts on Hu’s essay, and what it means for China in 2012. First, I agree with David Cohen that Hu’s essay, like everything uttered by any Chinese leader, is meant for internal Communist Party consumption. In the lead-up to the October 2012 transfer of power, Hu has two immediate concerns: creating his legacy, while mapping out the Communist Party’s future strategy. Second, what’s most interesting about Hu’s essay is not what he says, but what he doesn’t say: namely, that he chooses to focus on a problem that few in China think is actually a problem, while leaving out the still unresolved issues that he inherited ten years earlier from Jiang Zemin – the growing gap between the haves and have-nots, internal Party corruption, and China’s moral bankruptcy. Throughout his tenure, Hu emphasized these three issues in dour empty speeches, most recently in his speech commemorating the 90th anniversary of the founding of China’s Communist Party in July 2011. Meanwhile, these problems have only worsened. It’s always politically clever to use xenophobic fear-mongering to distract from real pressing issues, and this “last resort of scoundrels” hints at how desperate the Party has become. Third, Hu’s essay implies that China’s moral decay – as symbolized by last year’s Guo Meimei and Wang Yue cases – represents a failure of China’s cultural producers to influence the hearts and minds of Chinese, and not a by-product of China’s economic growth model. Yes, the People’s Liberation Army with song and dance did inspire peasants to join the Communist Revolution, but China today is no longer fighting against oppressive landlords and foreign devils, but rather itself; specifically, the much vaunted Beijing Consensus, a political arrangement in which the Party promises “prosperity and stability” if China’s middle class shuts its political mouth. The Beijing Consensus has given the Party short-term political legitimacy at the long-term cost of China’s economic development and social fabric. To understand how, consider Enron and Wall Street, both of which seemed to take pride in appealing to their employees’ greed. For a while their profits reached dizzying heights, but eventually Enron went bankrupt under the weight of its own lies and scams, while Wall Street would have gone under as well if Washington hadn’t intervened. And China’s economy, with its insolvent banks and staggering local government debt, may be the biggest house of cards yet. Daniel Pink in his book Drive argues that appealing to people’s utilitarian instincts leads to people being unhappy, uncreative, and unethical short-term thinkers addicted to making as much money as possible. This is evident in many of China’s middle class today, and the Chinese middle class obsession with accumulating Louis Vuitton bags is neither good for China’s economy, nor for its soul. Such calls represent an understanding that, in the new reality of the Internet, globalization, and the free market, unleashing the citizenry’s creativity and letting them open their political mouths are one and the same. If governments refuse to do so, not only will that hamper economic growth, but they could also lose political legitimacy and authority – as is increasingly the case with the Communist Party today. Unfortunately, China’s Communist Party is so because it lacks political imagination and because its obsession with maintaining power makes it blind to new realities. So expect more scary rhetoric and censorship, especially in China’s social media, in 2012.